The following information relating to the Halstead Workhouse was collated in 1922. 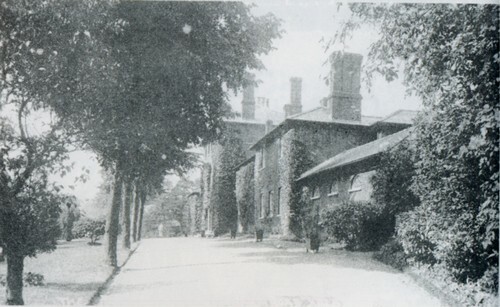 The Workhouse was built in 1838 on land which is now occupied almshouses next to the Halstead Hospital on Hedingham Road. It was demolished in 1922. At the meeting of the Halstead Board of Guardians on Friday, Mr. S.R. Long gave some very interesting facts about the old workhouse which is now being demolished having been purchased by Mr. S.A. Courtauld. The details gathered from the old Minute Book of the Board showed that the first meeting of the local Board was held on Nov. 9th. 1835 at the George Hotel, Halstead and weekly meetings were held there, or occasionally at the Castle Hedingham Bell until 1st March 1839, when the first meeting was held at the Union House. The Guardians took over the Parish Workhouses and used those situated at Halstead, Earls Colne and Sible Hedingham. The question of the provision of a central Union House to be erected at Halstead was first mooted at the meeting of 13th May 1836. This proposal was brought forward by Mr. G. De Horne Vaizey, who used to reside at Star Stile and the proposition was seconded by Mr. James Brewster, of Ashford Lodge, and father of the present Mr. C. E. Brewster. Mr. Samuel Courtauld of Gosfield Hall moved an amendment, however, that the decision be deferred for another year and this was carried by 14 votes to 5. Although this resolution was carried the matter was not allowed to drop for a year, because we find that at the meeting on 16th September 1836, it was resolved that a central Union House be built on ground between Halstead and Hedingham, not exceeding a mile from either place. On 18th November 1836 it was decided to advertise for a site, and on the 2nd December 1836 a committee of five members was appointed to find a site. On 27th January 1837 Mr. S. Courtauld moved the appointment of a building committee, and a month later Mr. Nash of Royston was appointed as architect. On 10th March 1837 Mr. Courtauld moved that the central workhouse be built for 300 pounds and that enquiries of Mr Wellesleye, solicitor, for 2 acres, part of Bois Field, as a site. This was carried, but at the meeting on the following week, the earlier part of this resolution was rescinded and the question deferred pending the report of a Parliamentary Committee. Mr. Courtauld, however, returned to the charge on the 5th May, 1837 and carried a resolution that the Central Workhouse be erected forthwith and a fortnight later Mr Nash's plans for the building were adopted. From the minutes the information is gleaned that the Guardians were often in difficulties over the question of a favourable site. The first offer was made by a Mr. Smoothy who offered two acres of land for the purpose. It was proposed that this should be accepted but no mention is made in the minutes where the piece of land was actually sited and it is not mentioned again. Similarly Mr. John Sewell offered 2 acres of land on Chapel Hill for £420 and the committee was instructed to inspect. Likewise a garden on Chapel Hill offered for £296 10/- did not receive approval. On September 15th 1837 tenders were received from Messrs. Steggles and Son, Mr Rayner and Mr Sudbury, but no sites were available. Enquiries for a site continued from September 1837 until February of the following year. An offer of Mr Edward May to sell 2 acres for £200 per acre was considered, and further enquiries were made of Mrs Gee of Hepworth Hall, Mr Osgood Hanbury, Mr John Sewell and Dr Taylor. Finally an agreement was signed on 2nd February 1838 to purchase 2 acres 1 rood, part of Bois Fields, of The Hon. William Pole Tylney Long Wellesley for £500, the amount which the Board offered. The law costs came to £284.15.10d., including £124.4s.8d to the Clerk's firm. On 9th March 1838 Messrs. Steggle and Sons tender was accepted. Neither the amount, nor their address is stated, but the total payment to the builders appears to have been £6,350. On the 21st December 1838, information was received that improper bricks were being used and the architect, Mr Nash was instructed to inspect. On the 18th March 1839 he was instructed to make a special report as to the Union House, and a fortnight later the Board was furnished with a copy of same. On the 13th April 1839 Messrs. Steggles immediate attention was required in the work and on the 28th June the architects decided that the boundary wall would have to be rebuilt to make it according to the contract. There appears to have been some financial difficulty from the commencement of the contract because on the 6th April 1838, the Board guaranteed Messrs. Steggles and Son to their bankers to the extent of the first instalment, not exceeding £1,000. On the 9th August 1839 the clerk was instructed to write to the architect asking him to state what sum the Board would be justified in in deducting from the balance due to Messrs. Steggles assignees taking upon themselves to complete the contract. A fortnight later the East of England Bank, Norwich, (Messrs. Steggles assignees) were informed that if the iron gates in front were put up according to contract the Bank would be paid the balance due to Messrs. Steggles less £500, it being reported the long continued delay in erecting the buildings and walls had very seriously inconvenienced and was a great loss to the Union. On the 11th October 1839 it was decided to accept £475 on condition that the gates were put up and completed. The total amount paid for the Workhouse £6,350. Whether the £475 deducted owing to the boundary wall not being erected in accordance with the contract was rebuilt there is no record. Judging by the wall it was probably not rebuilt. The total amounts paid in connection with the erection of the Workhouse including the cost of the land, lawyers (a total of 7 were employed), builder and architect amounted to £7624.8s.9d. After all the parishes made contributions totalling £1630, a sum of £6,000 was borrowed from the Economic Assurance at 5 per cent for 20 years.